The 2018 BWF World Junior Championships are being hosted in Markham Pan Am Centre, a city just outside Toronto, Canada. The Championships will take place from 05 to 18 November 2018 (News Story – BWF) (press release – Badminton Canada). During the Championships there will be a Coaching Conference, Research on Injury Prevention and Integrity Activations. You can download information about both these activities above. 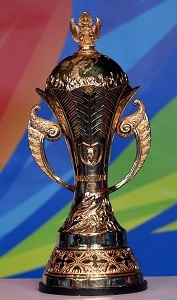 The BWF World Junior Championships is held annually and consists of two separate competitions: a mixed team championships for the Suhandinata Cup followed by an individual championships for the Eye Level Cups – all hosted over 12 days and attracting up to 50 teams and 400 players from around the world. The Championships provides badminton fans with a first glimpse of the stars of the future. The World Junior Championship is the first opportunity for talented young badminton players to represent their country in a world event in the sport. It is also an opportunity to experience top level competition and perhaps put them on the pathway towards becoming one of the stars of the future. The BWF World Junior Championships was first hosted in Jakarta in 1992 as an individual championships and the event firmly established itself as an elite world youth tournament. Justian Suhandinata, BWF Honorary Life Vice President, was a key driver for the introduction of the World Junior Championships. In the mid 1980’s he organised the Jakarta Open Junior Championships securing sponsorships and inviting all the best junior players from around the world. This event was the forerunner of the World Junior Championships. In 2000 the World Junior Mixed Team Championships started alongside the individual championships. In 2010 the Suhandinata family donated the stunning trophy to be presented to the winners of the World Junior Mixed Team Championships. The Championship cups for the individual events were initially called the Bimantara Cups after the first corporate sponsor of the Championships. This name continued until 2010. 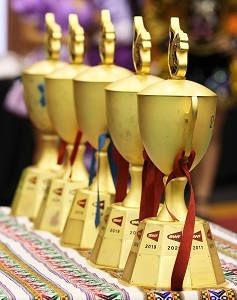 The 2011 edition of the BWF World Junior championship saw the birth of five new individual trophies called the “Eye- Level Cups”. Korean educational service provider, Daekyo, sponsored the annual junior tournament with the sponsorship running through to 2020. As part of its support, Dr Kang Young Joong, former BWF President (2005 – 2013) and Chairman of Daekyo, provides a total cash pool of USD36,000 to be given each year in scholarships for the winners of each of the five individual championship events.